Ayinla Omowura and his Apala Group, Ire wole de ( Owo udoji ), EMI 197? From the Nigerian Yoruba tradition, this music is called ‘Apala’. talking drums this is awesome music. Enjoy Ayinla Omowura. This entry was posted in Apala, Nigeria by Moos. Bookmark the permalink. Le fuji est une évolution de la musique juju. C’est une musique qui revient plus aux sources, délaissant les guitares électriques. Les prémisses du genre remontent aux années 60. Un style de danse fut alors créé à partir d’éléments venant des musiques apala et sakara. Basé sur les percussions yoruba et le tambourin sakara, le style s’impose surtout à la fin des années 80, supplantant la musique juju. Sikiru Ayinde Barrister en est le musicien le plus connu. Petit à petit, bien sûr, le fuji a évolué, notamment avec l’apport d’autres instruments tels que les guitares hawaïennes et le développement de grands orchestres aux percussions multiples. My understanding is that the Fuji genre grew out of Apala. Apala is the older form, around since the 1930’s. Fuji takes the music away from religious festival music and is a genre of popular music. The rhythms/feel are very similar, but I wonder if lyrics may be the primary distinguishing feature. Apala, a traditional style from Ogun state, one of yoruba state in Nigeria, became very popular in the 1960s, led by performers like Haruna Ishola, Sefiu Ayan, Kasumu Adio, and Ayinla Omowura. 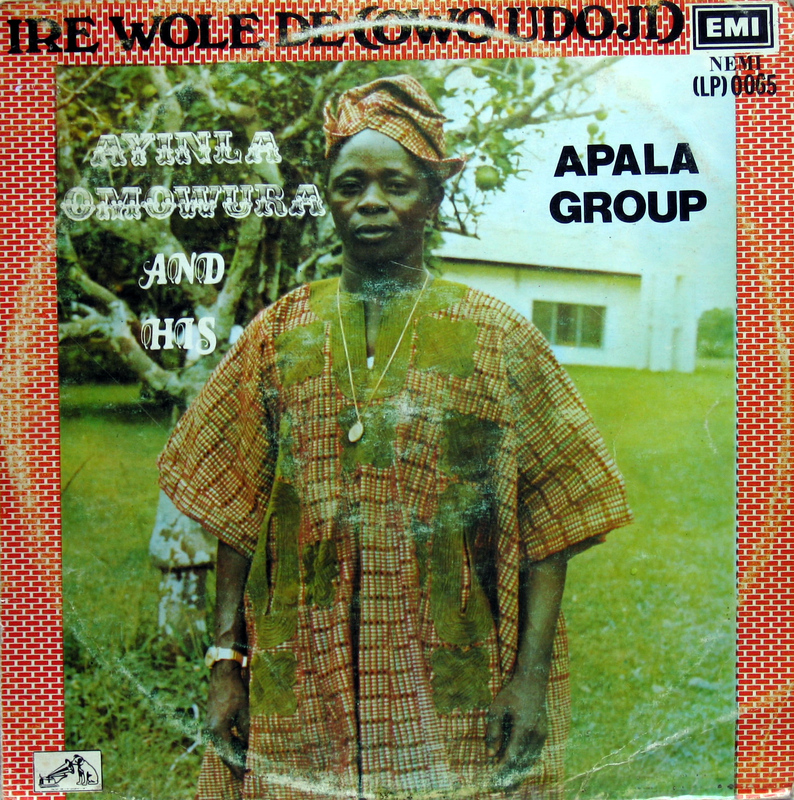 Ishola, who was one of Nigeria’s most consistent hit makers between 1955 and his death in 1983, recorded apala songs, which alternated between slow and emotional, and swift and energetic. His lyrics were a mixture of improvised praise and passages from the Quran, as well as traditional proverbs. His work became a formative influence on the developing fuji style. The late 1960s saw the appearance of the first fuji bands. Fuji was named after Mount Fuji in Japan, purely for the sound of the word, according to Alhaji Sikiru Ayinde Barrister. Fuji was a synthesis of apala with the “ornamented, free-rhythmic” vocals of ajisari devotional musicians and was accompanied by the sakara, a tambourine-drum, and Hawaiian guitar. Among the genre’s earliest stars were Haruna Ishola and Ayinla Omowura; Ishola released numerous hits from the late ’50s to the early ’80s, becoming one of the country’s most famous performers. Fuji grew steadily more popular between the 1960s and ’70s, becoming closely associated with Islam in the process. Fuji has been described as jùjú without guitars; ironically, Ebenezer Obey once described jùjú as mambo with guitars. However, at its roots, fuji is a mixture of Muslim traditional were music’ajisari songs with “aspects of apala percussion and vocal songs and brooding, philosophical sakara music”; of these elements, apala is the fundamental basis of fuji. The first stars of fuji were the rival bandleaders Alhaji Sikiru Ayinde Barrister and Ayinla Kollington. Alhaji Sikiru Ayinde Barrister started his fuji career in the early 1970s with the Golden Fuji Group,” although he had sung Muslim songs since he was 10 years old. He first changed his group’s name to “Fuji Londoners” when he came back from a trip to London, England. After a very long time — with hits such as “Orilonise,” Fuji Disco/Iku Baba Obey,” “Oke Agba,” “Aye,” and “Suuru” — he later changed the group’s name to “Supreme Fuji Commanders” with a bang!, “Orelope” that went platinum instantly. Ayinde’s rival was Ayinla Kollington, “Baba Alatika,” known for fast tempo and dance-able brand of fuji, who also recorded hit albums like “ko bo simi lo’run mo e, in the 80s he released “ijo yoyo, Lakukulala and American megastar” to mention few of his successful albums. With all due respect Ayinla Kollington is a coherent social commentator. He was followed in the 1980s by burgeoning stars such as Wasiu Ayinde Barrister. thanks a million guys, great info ! Thank you ever so much for your ambitious blog! I would be honoured if you would pay me a visit! All the best from snowy Stockholm! I linked you back, cheers..
Hello Moos, here a message from the land of ur forfathers! Apala is my all time favourite music, well one of the anyway. As i have been told in the golden 60’s there were 2 stars, like stones & beatles. One is Ayinla Omowura (he woiuld be the stones, because his voice is more rough) and the other one is Alhajji Haruna Ishola. oh no fuji link dead… the people would appreciate a reup.